What you are looking right now, is some of finest cloth finesse that Joker has ever put on. Here is the Suicide Squad Joker Jacket that has given the infuriating burden goosebumps immediately. The attire is long enough to let you prop up the ploys that’ll stunt your cosplaying competitors with a vogue-vague instantaneously. 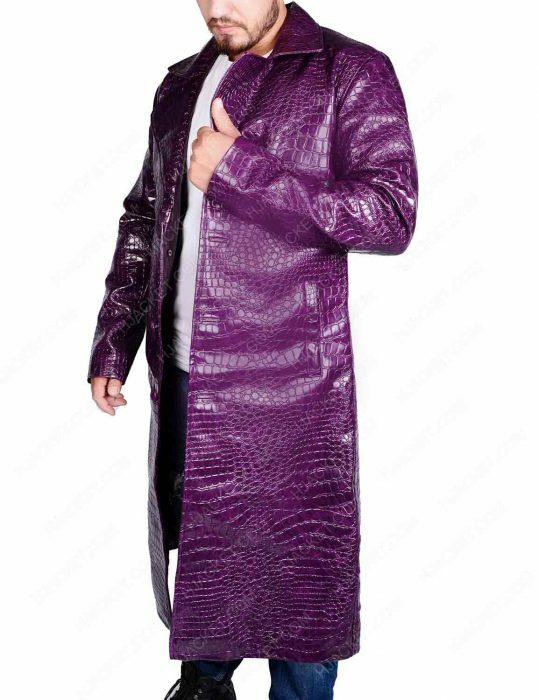 The long lasting exterior wardrobe spec comes a classic purple touch and tragically impacted with some crocodile patches overall. Extensively built up to let you make up for the trendy street walks and events as well, this Joker Coat is likely to immerse you with all the intuitive identity exemplars. Comprehensively, the jacket is stamped with the front button closing altogether with two vertical pockets. Additionally, the collar style is meticulously made a lapel style collar along with hand ends imposingly encouraged with open hem cuffs. We are looking towards a new-fangled spread-smile augmenting attire of Joker made from premium PU leather exclusively rooted with deluxe viscose lining. Unquestionably, the movie Suicide Squad has offered us some of the exquisite epitome surprises. Among them are the most fancy-specter attires. Starred by Jared Leto Joker Coat, we are witnessing some of the prominent and petrifying evil character ever created in the comical domain. One of the most tremendous yet with a terrible mindset comes the Joker straight from the Gotham City. Let be in the maddening mood when you’re out with your buddies, you are about to scare the pants off of the crowds. Dope Lit and Looks Authentic. Dope Lit and Looks Authentic. After hard details and delays I finally laid eyes on this one. The purple color gleams are extremely rare from other merchandise that I found online before this one. The splinter scheming is nicely done on this outfit and that what makes it a winner wear for me. More other features that are really well made and shows 100% legitimacy of this website. Good job at the backhand of this outfit and I really appreciate that you guys are trying to emulate the real attires being worn by celebrities in highly acclaimed movies. Tonotch Joker merchandise. Worth buying! Tonotch Joker merchandise. Worth buying! This faux leather constructed coat is really well maintained and I couldn’t find any resentment when I received my parcel yesterday. Leather finesse is stunning. The distress fissures is one of its main features. Meticulously made and a good and calm suit for your bodies. 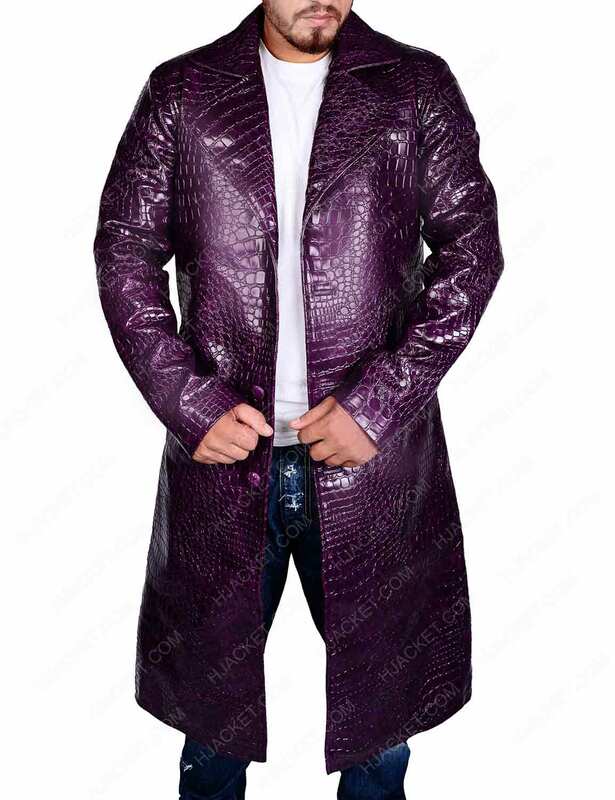 Love this Joker Coat. Beautfiully built. 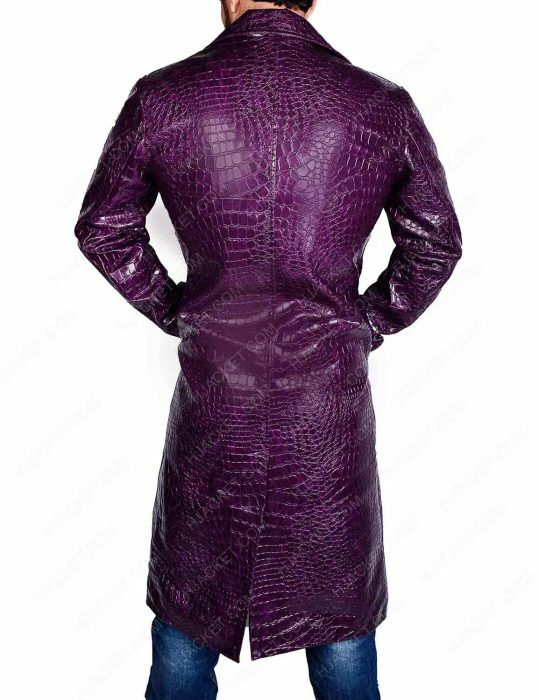 Love this Joker Coat. Beautfiully built. The Suicide Squad movie was one of my favorite picks when my friends arrived at my house on the weekend movie night scene turn. This was darn DOPE and I couldn’t forget how it turned out to be a sheer screen weed in no time. This Joker jacket first off feels like a snake skin lol - that’s how this faux leather feels like, adding a bit poison mocking aspect straight into this long coat. Love the long sleeves and how they have made a bit wide so that you could hold up all that fanciness going in this body feasible out wear. The button added to the front are embedded in with a squeeze in impact. Flawlessly created trench clothing that gives away a crazy look to your identity. Everything is in agreement to the site item specifying and I feel truly humble for those folks who made this outfit with the most extreme legitimacy. 5 stars all the way for this stylish Gotham Joker trendsetter.